Lily’s here at the Goodwill again, feeling the coats. 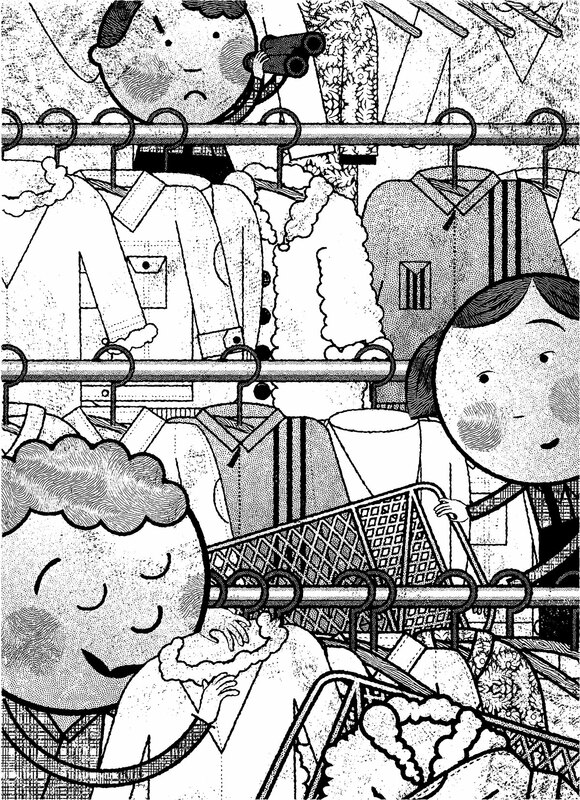 Whenever Lily sees an old coat, her eyes fill with colour and notions: mauve bouclé wool, three-quarter raglan sleeves, purple buttons like thick plastic bowls. I’ve seen her in the aisles with six coats piled up. I’ve scooted around from behind the counter to roll extra shopping carts her way. “Here you go. I’m Gina,” I’ve tried to say, but before I could get it out she’d already be shifting stuff from one cart to the other, deciding which coats to buy. But you know what always happens. She has to take them all. If she didn’t save them, who would? I’m not Lily’s mom, though I’m sure old enough. And I’m not exactly who she’d pick for a friend. She’s got that thick red hair and those skinny eyebrows. She’s young and beautiful, and I’m...well, you know. But I found out some stuff about Lily a while back. Eric was new as the manager then. His very first day he asked us about pickers—customers who resell the merchandise to vintage stores. Right away I thought of Lily. All week I worked in the back room, sorting donations, stuffing my hands into pockets. I threw out a mountain of Kleenex. I found some underwear in the pocket of a pair of jeans, and I threw that out, too. But I kept all the change I found, and by Friday morning I had enough. My plan was to invite Lily out for coffee so I could warn her about this picker stuff. I wasn’t sure she was one, but how else to explain all the coats she bought? She came in around three. In a few minutes, I swung an extra cart her way, and she gave me a little smile. Nice, you know, but not the kind of smile you can start talking to. I’d planned to look her in the eye and suggest coffee, but her eyes weren’t having nothing to do with mine. They were all over her old coats. Her face was melty. She wasn’t going out with me. She was going home to bond with her clothes. What could I do? With a quick glance at Eric’s back, I locked the cash and followed Lily out. It was lucky I had that money, because Lily and I took a bus. I sat staring at her from a few seats back. Then she rang the bell. On the sidewalk, she bounced the bags in her arms like they were lumpy children. I followed along until she turned at a boxy duplex, then I huffed up. That’s how it happened. How I was invited into Lily’s coat-swaddled apartment. Outerwear was everywhere. Covering the couch, spread on the floor, laid out as if for burial on the kitchen table. I picked up a mohair overcoat and stroked its silky bristles. “It’s like a brush cut,” I said. I guess I said the right thing. I remembered seeing that coat in the back room and almost pitching it into the Dumpster. I muttered, “Guess you’re no picker,” but Lily didn’t hear, and I was glad. I didn’t get fired from the Goodwill that day. I told Eric I was trailing a picker. That cheered him up. I warned Lily about piling up her carts. I told her to be discreet. Come more often, buy one or two pieces at a time. Come on weekends; I work weekends. Now there aren’t so many needy coats on the racks, anyway. It’s not that I buy into the whole thing. I’m not a saviour. I still chuck out the odd coat. But I’ve also got my little pile set aside. Not for me, not because I feel for them, but for Lily. Because it makes her happy. Ania Szado lives in Riverdale. Her fiction has appeared in This, Lichen, and (Ex)cite. Her first novel, Beginning of Was, was published by Penguin in 2004. Last updated summer, 2003.